To the best of my knowledge, my grandmother Imogene Walker — my mom’s mom — never met a celebrity in her life. She spent most of her 88 years in a tiny red house on a hill outside Carmi, Illinois, raising three kids, taking care of my farmer grandfather and the workers who’d help out as the seasons came and went, doing her crosswords and reading her magazines. And she was as plugged-in to the world as any person I knew. She understood pop culture (even if she didn’t like most of it), she understood politics (even if she didn’t like most of it), she understood the power of mass media, because she was an unabashed consumer living out on the Big Prairie. If it hadn’t been for our annual family vacations to that tiny red house in the country, I wouldn’t be a writer today. I absolutely believe that. Growing up, my grandmother and I would have long talks about whatever was interesting me that year: from Star Wars to comic books to sports to you name it. All those interests were looping around the media landscape that was ever-present in their house, because the TV was on all the time and magazines and newspapers were everywhere. Those one-to-two-week stays outside Carmi were a bit of a refuge, because I knew I could dive into a virtually endless stack of reading materials and the time would pass by. So there’s an additional layer of sadness this week as David Letterman signs off from his amazing television career, because it was in that living room on the hill outside Carmi that I first discovered Dave, in the late ‘70s as a guest on Carson’s Tonight Show, then his short-lived NBC morning show (which I’m pretty sure I saw the debut of), then him kicking off his version of Late Night following his hero Johnny. 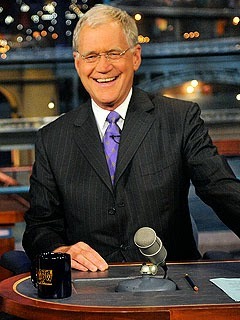 I picked up the Letterman fandom from there, with the meat of his NBC career happening while I was in college, then jumping to CBS and his Late Show not long after I relocated to Nashville for good. I remember the drama of who’d be Carson’s successor, and was always on Team Letterman. Obviously, television watching patterns ebb and flow as you go through your 20s, 30s and 40s, and over the past decade or so, yes, if I was watching TV at all past 10pm, it was to watch Stewart and Colbert, both of whom will also change their availability this year. But Letterman was always there, always present when something happened in the world that needed a razor or blunt instrument taken to it, and even as he got grumpier and grayer, his take on the world got that much sharper. So as Dave gets ready to flip the switch of his genius television career to the off position, you have to forgive those of us who’ve been fans. We’re losing access, however fleeting a late-night television program can be considered “access,” to somebody who’s been a constant for us for more than 35 years. It’s a tough pill to swallow. There’s been the predicted cavalcade of stars and tributes and montages and moments as we hurtle toward Wednesday’s final broadcast, but my favorite moment from the show came not from Dave, but from his longtime sidekick/musical director/fellow genius Paul Shaffer. Starting with the four-piece known as the World’s Most Dangerous Band and wrapping up with the CBS Orchestra, Paul has been such a constant at Letterman’s side, crafting the perfect walk-in moments and backing the Who’s Who of the Who’s Who of the musical world. Say what you will about the viability of the institution itself, but a case can be made for Paul Shaffer as a member of the Rock And Roll Hall of Fame. Shaffer and the WMDB put together what they refused to call a “music video” for a Late Night prime-time special in 1985, with an original called “Dress Cool.” Does it hold up, sonically or visually, 30 years later? Don’t be silly. But it was intended to be silly, much like most of content that came out of Letterman’s orbit over the past three decades. It didn’t take itself too seriously (or seriously at all), and I think that’s what most of us liked about Letterman. He, and the supremely talented people who worked with him, knew this stuff wasn’t necessarily going to change the world, and if it didn’t, well, there was always tomorrow to try again. After tomorrow, it’ll be somebody else’s turn to try. Thanks, Dave.